Editor Charles Maldonado talks about tourism taxes, jobs and data with Stephen Perry. And education reporter Marta Jewson discusses one of her latest stories, a collaboration with HuffPost on the Center for Resilience. Happy New Year from Behind The Lens. Michael Isaac Stein on Kristin Palmer’s new short-term rental proposals and the Entergy Charitable Foundation. Marta Jewson has the latest on Harney charter school. Video of a drug bust leads to renewed questions about the city’s sprawling surveillance network. Producer Tom Wright hears from people who were left ill after the Deepwater Horizon oil spill in the Gulf of Mexico in 2010. Jonathan Henderson on the Taylor oil spill. Michael Isaac Stein on Entergy New Orleans. And Eve Abrams on the habitual offender statute. 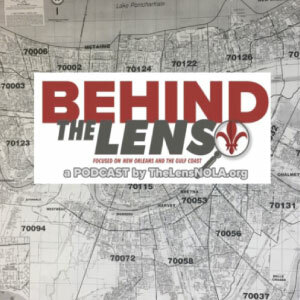 From September, Karen Gadbois talks with Tom Wright about her S&WB billing problems. Plus an update recorded this week. Marta Jewson on school closures. Michael Isaac Stein on how Cantrell’s budget plan will impact the public defenders office. J.P. Morrell on Amendments 2 and 6. Marta Jewson on Harney charter school and state school ratings. And Michael Stein on the city budget. Michael Isaac Stein on Entergy and paid actors. Kerry Nix on lead poisoning. And Charles Maldonado on The Lens’ fake subpoena lawsuit. Columnist Peter Horjus on Amendment 6, a proposal on the Nov. 6 ballot. Marta Jewson talks about asbestos in New Orleans schools. And Michael Isaac Stein has the latest on a new anti-violence initiative.